First, if you want to have eternal life, turn to Jesus Christ. Choose this day whom you will serve! Secondly, Easter is about life. I want to encourage all of us this Easter to reject the growing culture of death around us and, instead, promote a culture of life. Why? Because when Jesus destroyed death through his resurrection, he also destroyed the culture of death and opened the way to us of a culture of life. Choose this day whom you will serve – the thief who brings death or Jesus who brings life. We all know about the random killings that have been taking place, especially of women, and the delay in solving the mystery of who the killers are and bringing them to justice. The increasing number of deaths and the seeming inability to do anything about them is part of our current culture of death. This is not the way of Jesus. The desire on the part of some government leaders and organizations to legalize abortion is promoting a culture of death to the most vulnerable among us. That is, the unborn. This is not the way of Jesus. The way of Jesus promotes life, not death. When hospital workers steal vital drugs to sell elsewhere, they deprive the living of essential life-saving treatments. That is a culture of death. And, then, family members are willing to pay more to bury a person and put cement and tile on their grave. Yet, the same amount of money could have saved their life. The way of Jesus promotes life. Let us also promote a culture of life in our work places, families, and communities. When someone kills someone else just to steal a phone, what does that tell us about the value of life? It says that “life is cheap.” But, actually, life is not cheap. Jesus died and rose again so that we could have life. Life is very costly. The culture of death has taken control of South Sudan and many Provinces in eastern Congo, and has had a big impact on Uganda. I want to thank the President, the government, and the people of Uganda for welcoming so many of our neighbours who have had to flee for their lives. As Christians, we must oppose this culture of death and killing. We must also oppose a kind of politics that is more about keeping people in power while many people die in the process. This culture of death extends even to violence in our own country. We too easily resort to violence in order to resolve conflict – even petty conflicts. That is not the way of Jesus. Recently, an Honourable Member of Parliament gave an interview on TV about the importance of husbands beating their wives in order to “streamline” them. 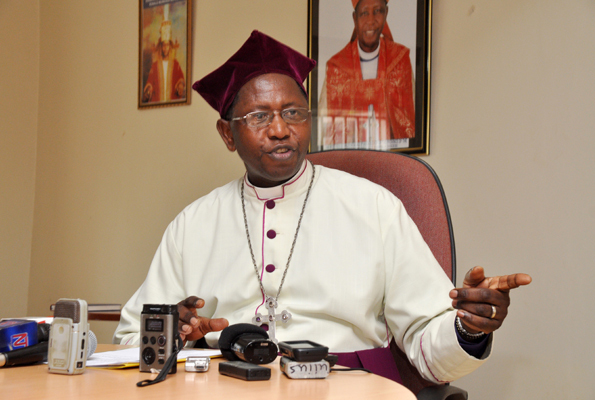 I want to state categorically and very clearly that the Church of Uganda does not support his views. Even though he is an Anglican, he and his views do not represent the Church of Uganda. We condemn all domestic violence. No exceptions. Men – it is NEVER right to beat your wife. Women – it is NEVER right to resolve conflict with violence. Women – you should never believe your Aunties when they tell you that if your husband doesn’t beat you then that means he doesn’t love you. That is a lie. Listen to me carefully. The position of the Church of Uganda is that domestic violence is always wrong. Always. I am glad to know that the Hon. MP has apologized before Parliament. I urge him to now show the fruits of repentance and become a public leader in the fight against domestic violence, and in his own family and marriage to practice love and preach love to others. In two months’ time, we will remember the Martyrs of Uganda at a special celebration in Namugongo on 3rd June. This year’s Martyrs’ Day organizers are the Dioceses of greater Kigezi. The co-Chairs of the Organizing Committee are Honourables Ruhakana Rugunda and Amama Mbabazi. They are challenging us to double the number of Anglicans participating in the 3rd June Namugongo celebrations. There will be a health camp as well as other programmes for children and youth. I urge you to make a special effort to mobilise big numbers from your dioceses to participate in this year’s Martys’ Day celebrations. In conclusion, I sincerely appeal to you this Easter to renounce once and for all the growing culture of death in Uganda and embrace the culture of life that Jesus offers us through his death and resurrection. Choose this day whom you will serve! Will you serve the thief who comes to steal, kill, and destroy? Or, will you serve Jesus who came to bring life? If the 80% of Ugandans who claim to be Christians actually renounced the culture of death and promoted Jesus’ culture of life, then Uganda would be a very different place than it is today. My Brother Bishops, Clergy, Lay Readers and all Christians in all our Dioceses and All of you fellow Ugandans! I wish you all a joyful Easter. May you fully and completely choose Jesus this Easter so that Easter 2018 will be a turning point in your life and in our life as a country. © 2016 All Saints' Cathedral Kampala. All rights reserved.